"Listen, they're going to come for me. And now that we've made contact, they're going to come for all of you, too." That's a sad, but true quote from Joseph Gordon-Levitt in Snowden, the greatest film of the year. The film is based on the books The Snowden Files by Luke Harding, & Time of the Octopus by Anatoly Kucherena. Gordon-Levitt plays Edward Snowden, the infamous NSA contract worker who revealed thousands of classified documents in an interview with journalists Laura Poitras (played by Melissa Leo), Ewen MacAskill (played by Tom Wilkinson), & Glenn Greenwald (played by Zachary Quinto). Snowden originally enlisted in the US Army Special Forces, but was discharged after breaking both legs. After this, Snowden meets Lindsay Mills (played by Shailene Woodley), starts a relationship with her, & joins the CIA. While there, he is mentored by two CIA recruiters: Hank Forrester (played by Nicolas Cage) & Corbin O'Brien (played by Rhys Ifans). Snowden is then sent to Geneva, where he meets Gabriel Sol (played by Ben Schnetzer), who alerts him about how the NSA is spying on the American people. After resigning from the CIA, joining the NSA, breaking up & reconciling with Lindsay, & having a seizure, Snowden is sent to Hawaii to work for Booz Allen Hamilton, a government contracting firm. Eventually, Snowden becomes disillusioned with the government's use of mass surveillance, & leaves to go to Hong Kong, where he reveals the documents to Poitras, MacAskill & Greenwald, eventually leading to him living in Russia, seeking asylum. 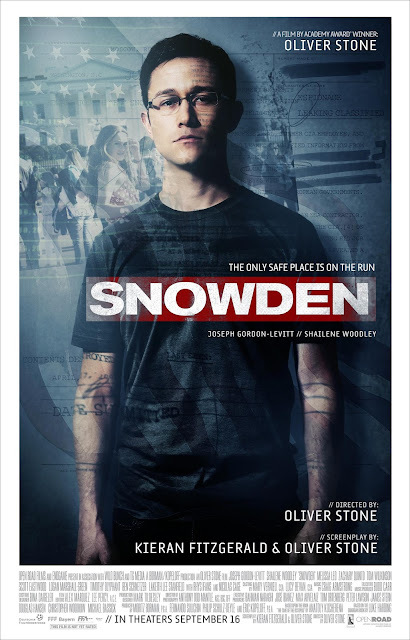 The cast, especially Gordon-Levitt, Woodley, Leo, Ifans & Wilkinson, is excellent, with Gordon-Levitt's performance being one of the best performances of the year so far, perfectly capturing Snowden's voice, appearance, & mannerisms. Oliver Stone's direction is spectacular, with this being his best film since his 1991 masterpiece JFK. The screenplay from Stone & Kieran Fitzgerald is brilliant. The editing from Alex Marquez & Lee Percy is the best of the year so far. And the cinematography from Anthony Dod Mantle is amazing. This is the best & most important film of the year. Whether you like or hate Edward Snowden, you owe it to yourself to see this film & make a decision for yourself on this absolutely important topic. (Also, this film shouldn't have received an R rating. There were only a few uses of the F-word, & a couple brief, non-graphic & non-explicit sexual references. Why is the MPAA not letting teenagers (without a guardian) see the movies that they need to see? This film is extremely important for our generation, because we are the ones who are growing up in this era of mass surveillance, & it's up to us to change it).